Over the first couple weeks of the season yours truly has been consistently advising fellow Sharks fans to wait until after the rough first part of the schedule to come down hard on the team. Sixteen of their first 21 games to start the season on the road is absolutely brutal for a west coast team. However, losing four straight games in regulation capped off by a listless performance at home against Buffalo, well, can’t exactly defend the Sharks from any level of criticism. This tough first two months of the schedule is no excuse to be out-shot attempted by the worst team in the league during the first period. San Jose is too talented for that to happen. Everyone has their off nights, but you would hope there would be more fire lit to end a three game skid before hitting the road again. The most troubling of all is that this isn’t just four bad games. Outside of the season opener in Los Angeles, you could argue the Sharks have yet to play another good game. Their record may say 4-4-1, but they were out played in their 3-0 home win over Winnipeg, lucky to win a shootout in Washington and played a decent 40 minutes in a 4-2 win in New Jersey. Perhaps you could say the New Jersey win was a good game, but even then, that is at most two quality outings out of eight. Do They Believe in McLellan? 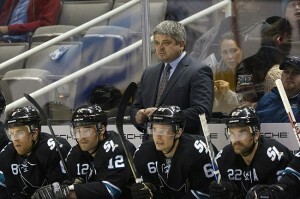 Head coach Todd McLellan has now taken the captaincy away from the team’s two most notable stars. If you ask the Sharks players, they all say nothing but good things about their head coach to the media. However, no player is ever thrilled to have the C removed from their jersey. One has to wonder how much the players in that room believe in the coach’s message or personnel strategy. As mentioned before, Marleau sounds as if he prefers Brent Burns at forward, and it’s hard to believe Joe Thornton enjoyed having his linemate taken away from him. Burns and Thornton dominated the league together as a forward duo. Thus far this season Burns has looked bad defending his own zone as a defenseman. It would be naive to think there aren’t multiple people in that dressing room who want Burns back up front. During this past offseason McLellan and GM Doug Wilson said that “the message” didn’t get through to the players. Perhaps the players thought the message was the wrong one? The message that got sent at the end of the playoffs was that the top players were the reason the team failed. Despite not having anywhere near the same forward nor defense depth as the Kings, Blackhawks, Bruins, Rangers, and others. The organizational blame was put on Thornton, Marleau, Pavelski, Couture and company. Only problem is, that’s as good as a core group of top players as you’ll find in the NHL, blaming them is rather ridiculous. The blame must be placed on the men in charge running the ship because the Sharks have plenty of top end caliber talent. What they lack is an identity and quality depth. They seem to prefer players like Mike Brown and John Scott who don’t score nor play any defense over players like Tyler Kennedy, Daniel Winnik, and the McGinn brothers. If you talk to some around the organization, one of the reasons Jamie McGinn was traded two years ago was because he wasn’t willing to drop the gloves on a regular basis. Have I mentioned the Sharks seem to be stunk in the 1980s? The current San Jose waters are as murky as we have seen in recent years. At least for the longest time, the organization seemed to stick up for the faces of their franchise (Thornton and Marleau) but that time is gone. The dressing room as a whole used to feel like a tight knit group, but that feeling is long gone. It had appeared the Sharks were going to play Pavelski at third line center against Buffalo on Saturday as he practiced in that spot on Friday. But for the eight straight time to start the season Pavelski was a top-six winger against Buffalo. This team has no continuity whatsoever, their top-pair puck mover from the second half last season was scratched for the second time this season vs the Sabres. Marc-Edouard Vlasic and Jason Demers thrived together as the top pair during the second half last year. Furthermore, nearly all of the Sharks’ long hot streaks the last few years have come with Pavelski as the third line center. Despite that fact, Pavelski has more often than not been in the top six since the Tomas Hertl injury last December. Sure, he scored 41 goals on Thornton’s wing but what is more important? Scoring goals or winning games? The Sharks are 6-2 the past two years in the postseason with Pavelski at center and just 4-6 when he plays wing. Between the apparent aversion to playing Pavelski at center and to giving Demers a chance with Vlasic before scratching him, the Sharks aren’t making a lot of sense.